The College of Mass Communication and Media Arts (MCMA) has a dedicated academic Living Learning Community (LLC) for students in its majors. 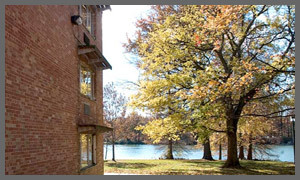 Kellogg Hall, located on West Campus on the banks of scenic Campus Lake and a quick five-minute walk to the Communications Building, is a dedicated residence hall for MCMA majors from Cinema and Photography; Radio, Television, Digital Media; and the School of Journalism. This common living space promotes community building within the college and supports the transition for many new students as they acclimate to life at the university. Kellogg Hall's close proximity to the Communications Building allows students easy access to learning resources, studio spaces, and additional computer labs like the New Media Center. Much of the work students do for their classes is collaborative, and living in the same LLC helps facilitate the successful completion of such projects. Kellogg Hall also hosts numerous activities for MCMA students during the academic year. Each August, faculty and staff from MCMA are eager to welcome new students to campus (they even help with move-in!). For more information about Kellogg Hall, please contact Rita Medina, Coordinator for Recruitment and Retention, at 618-453-7713 or rita.medina@siu.edu.